My grandmother did it. I bet your grandmother did it. My mother sometimes did it – especially if she had a head ache. Zia Caterina did it religiously. This ancient summertime ritual is practiced in homes all over Pontelandolfo. The practice saves energy, keeps you cool and relaxes the hell out of you. It is so simple, so effective that I know you will want to experiment yourself – just don’t tell any of your energy hog neighbors – they wouldn’t understand. Actually, don’t tell any of your neighbors. Just let them wonder why all of the blinds are closed and what exotic fantasies are going on in that dark, dark house. She must have sun stroke. What the heck is she talking about? Keeping the sun at bay and heat out of your house – that’s what! At night open all the windows and let the cool night air in. As soon as the sun rises, slam the windows shut and close all the curtains or the shades. Now the house will be dark, the sun’s heated rays thwarted by the ancient ritual. You will save a bundle on air conditioning. Our two story stone home in Pontelandolfo is the perfect style house for this type of cooling system. 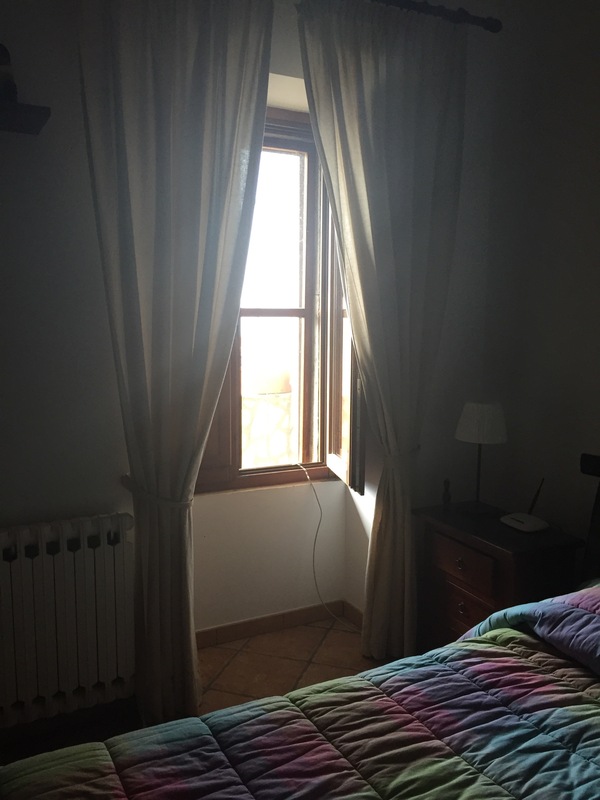 It has wooden indoor shutters on every window, so that the house can stay really, really dark. We open all the second floor windows at night and let the cool night mountain air waft over us. Then in the morning we slam all the windows closed and latch the shutters. I actually used this same technique when Jack was on the road and we lived in Asbury Park. Oh yeah, you noticed I said “When Jack was on the road”. Everyone in the house has to buy into the system and not go around opening all the curtains – or shutters. The other thing you have to train your family to do is NOT turn on the electric lights just because the room is dark. So how do you read, see, cook? Think about it my friends. How can you accomplish what you want – a cool house and lower electric bills with out turning on the electric lights? Duh. Open a curtain! As I calmly explained to Jack – think of the window shutter in the bedroom as the light switch. If you go into the bedroom and it is dark, open one shutter and let the sun light the room. When you are done. Turn off the light – close the shutter. Such a simple way to cool your home. Such an effective way to lower your energy bill. Such a great way to create angst and animosity in a family. If you live alone or are the alpha dog, try the ritual, stay cool and piss off the electric company. Is this another subversive way to say how much you hate the ugly new windmills that dot the landscape around you? Do they even have any of them working yet? It would be a shame to build them and not bother to use them. The ugly wind mills are spawning more and more wind mills. We do see a few of them working. Wonder why they haven’t put any on the hills of Rome? We use a fan to bring in cool air at night (lowers the temperature in our south facing bedroom to a comfortable sleeping temp after a day of high temps and humidity). It has a thermostat and automatically turns off when the temp reaches 71. This morning my house is a perfect 70 since the outside dropped to 68) and it’s quiet except for the sound of my neighbor’s AC. CFL bulbs run cooler and also help keep the temps down. Saving the planet one cool night at a time. Thank you for all of your Diane Lane/Tuscanny moments. Often we need to get out of the environment we grew up in to see it from afar and see it with new eyes. Keep the columns coming, i love them. I love a happy reader! Find me a publisher for the Diane Lane memoir! !